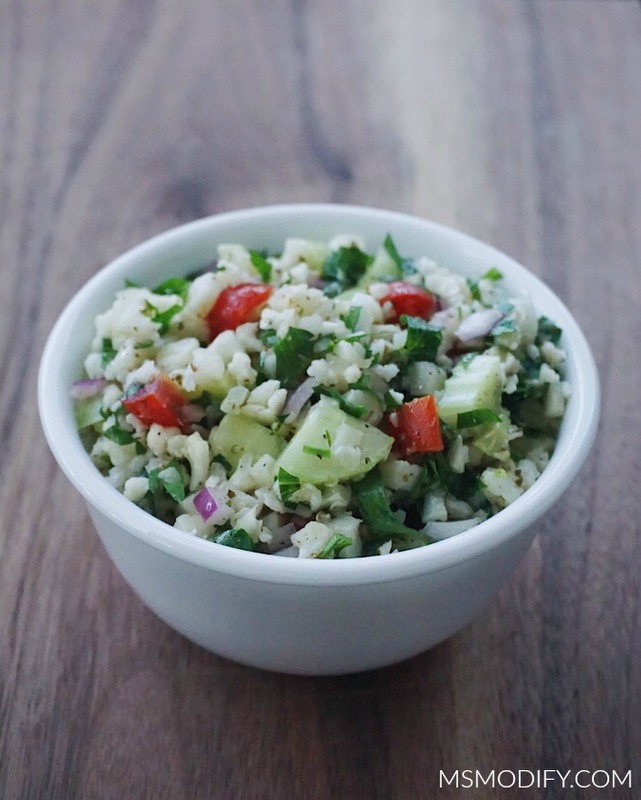 This Cauliflower Rice “Tabbouleh” is a gluten free version of a classic favorite salad! All the same bold flavors, without any grains, makes this a healthy vegetarian lunch or side dish! 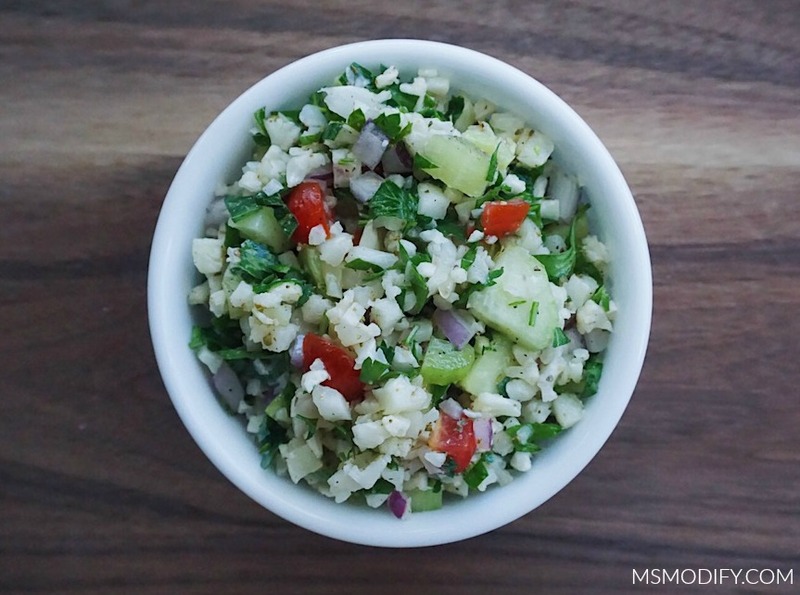 Before getting diagnosed with celiac disease, tabbouleh salad used to be a favorite of mine. Since traditional tabbouleh is made with bulgur (wheat), it is no longer an option for me. I then decided to modify tabbouleh salad using quinoa and it was delicious! However, recently after trying Whole30 and realizing I don’t tolerate quinoa very well, I’ve been eliminating it from my diet. Oh great, one more thing to not eat!! I didn’t let this stop me, I just decided to use riced cauliflower in place of the quinoa/tabbouleh… and you know what?! I don’t miss the grains at all! The first time I made this with cauliflower, I didn’t tell Erik what it was and just put it on his plate… and he didn’t even notice the difference until after I told him! Heat skillet over medium heat and drizzle a little olive oil, add riced cauliflower and saute for about 5 minutes. Remove from heat and allow cauliflower to cool completely. Once cooled, place cauliflower in large a bowl and add your chopped vegetables and parsley. Mix until everything is evenly combined. In a small bowl, whisk together olive oil, lemon juice, oregano, garlic powder, salt and pepper. Pour dressing over “tabbouleh” and stir to coat. Taste and adjust salt and pepper to your liking, you can also add more lemon juice if needed. 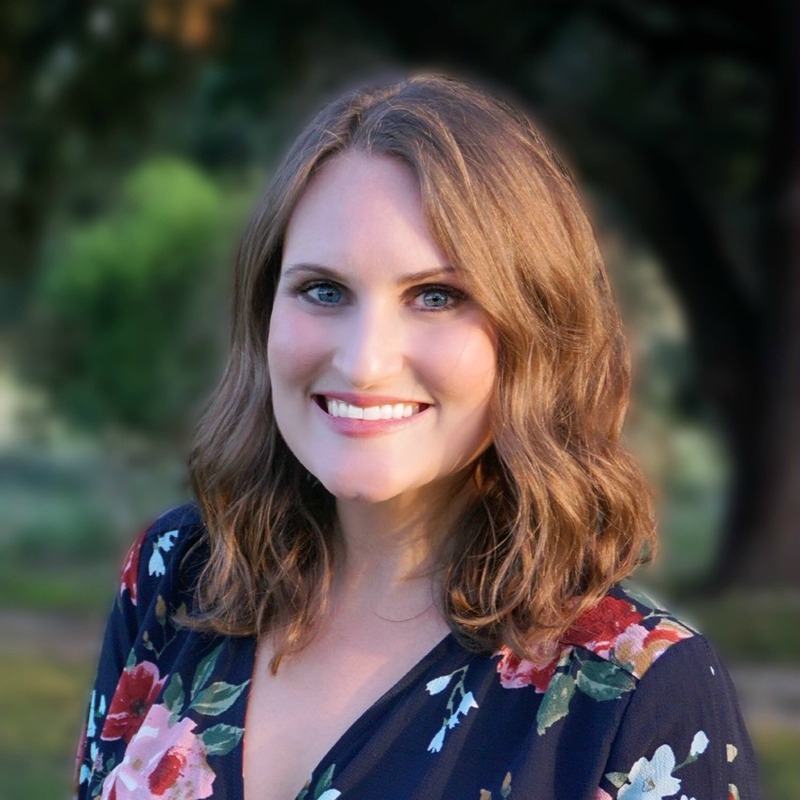 This entry was posted in Recipes/Dining Out and tagged grain- free, paleo, salad, vegetarian. My Dad loves tabbouleh so I’m going to have to try and make this for him! I think it’ll be a huge hit! Ohh yes, you should make it for him! My husband didn’t know it was cauliflower until I told him!